UCOG Today [Paul Kieffer] » Blog Archive » Pyromaniacs? 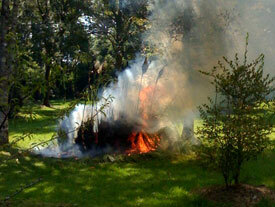 With all the burning going on around here, you might wonder if we have a closet pyromaniac or two in the family. Monica and her sister are busy clearing brush from our adjoining properties here that have not been used much over the years. Now they are intent on clearing the land to plant some fruit trees. The clearing process is being done by hand, and in some places the vines are so thick they form a canopy engulfing the smaller trees and bushes. Once or twice a week they burn all the stuff they have cleared. While they are at it, they decided to make grass cutting a little easier in the main part of the yard by burning down some pampas grass that had developed into somewhat of an obstacle for the riding lawn mower and the string trimmer. The grass has grown to a height of about six feet with a diameter about that twice that size, but it was taken care of in about ten minutes. Once the roots are dug out the lawn grass will take over and make for a smooth ride on the riding mower.